Cataracts are the opacification or loss of lens transparency that leads to progressive loss of vision. The lens is a totally transparent and lentil-shaped organ located inside the eyeball just behind the iris. Symptoms of cataracts vary. Vision becomes blurred and the patient sees as if looking through fog. Discomfort with sunlight, changes in color vision, difficulty driving at night and double vision are issues that may occur with cataracts. Depending on the degree and location of the cataract, vision can be almost normal or it can cause almost total blindness (only sees and locates light). When a cataract is total, the ophthalmologist cannot assess the condition of the retina and optic nerve before surgery and must resort to special examinations (ultrasonography, electroretinography). 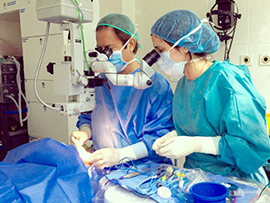 Surgery is the only effective way to remove a cataract. Emerging opacities (cataracts) do not require surgery. The cataract should be removed when the resulting loss of vision interferes with work activities or the person’s lifestyle. The technique of choice today is the phacoemulsification of the lens, which is performed through a small incision with local anesthesia and. The procedure is quick and outpatient. Normally stitches are not needed in the eye, it can be uncovered outside the operating room and recovery is quick. The lens must always be replaced with an intraocular lens that allows us to focus. The lenses may be monofocal (for to see far) or multifocal (to see near and far) and assess in each case whether to place one or the other.